A couple weeks ago, I got the urge to bake some biscuits to go with the big pot of vegetable-beef stew I had simmering on the stove. I rarely make biscuits because we don't eat refined carbs most days. But once in a while, I just get a craving for old-fashioned comfort food. And, light biscuits are still on my list of things to master before I die. Both the fluffy kind, and the flaky kind. So now, I probably have you thinking this post is about biscuits, and it really isn't. 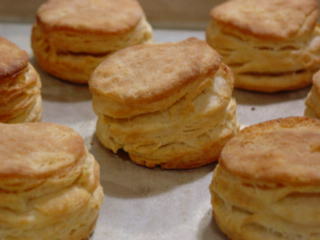 I found this recipe for Flaky Buttermilk Buscuits in Cook's Illustrated (Jan/Feb 2006), and decided to give it a whirl. Not too bad, huh? What today's entry's about, is the technique utilized in this recipe for flouring the counter. It worked so well for me, I thought I should share. Ordinarily, I just sprinkle or dust the flour over the surface, as evenly as I can, but sometimes I get a few "drops" that need smoothing out. And sweeping your hand over the top, really just wipes the flour away and it ends up too thin to keep wet or soft dough from sticking. The author, Sean Lawler has you first spray the counter lightly with non-stick spray, and spread the oil evenly with a cloth or paper towel. It really gives the flour something to adhere to, but the dough releases easily. It worked really well for laminating this sticky biscuit dough, and I think it would be great for rolling out pie pastry too. Try it. Regarding dusting the bench: I use a flour shaker, which gives me a pretty even dusting. I really like the idea of spraying the countertop first. I've made more than my share of biscuits lately and noticed how sometimes areas are prone to sticking. This is a great method, I suppose, for pie crust as well. Makes 12 biscuits. Published January 1, 2006. The dough is a bit sticky when it comes together and during the first set of turns. Set aside about 1 cup of extra flour for dusting the work surface, dough, and rolling pin to prevent sticking. Be careful not to incorporate large pockets of flour into the dough when folding it over. When cutting the biscuits, press down with firm, even pressure; do not twist the cutter. The recipe may be prepared through step 2, transferred to a zipper-lock freezer bag, and frozen for several weeks. Let the mixture sit at room temperature for 15 minutes before proceeding. 1. Adjust oven rack to lower-middle position; heat oven to 450 degrees. Whisk flour, baking powder, baking soda, and salt in large bowl. 2. Add shortening to flour mixture; break up chunks with fingertips until only small, pea-sized pieces remain. Working in batches, drop butter slices into flour mixture and toss to coat; pick up each slice of butter and press between floured fingertips into flat, nickel-sized pieces (see illustration at right). Repeat until all butter is incorporated; toss to combine. Freeze mixture (in bowl) until chilled, about 15 minutes. 3. Spray 24-inch-square area of work surface with nonstick cooking spray; spread spray evenly across surface with kitchen towel or paper towel. Sprinkle 1/3 cup of extra flour across sprayed area; gently spread flour across work surface with palm to form thin, even coating. Add all but 2 tablespoons of buttermilk to flour mixture; stir briskly with fork until ball forms and no dry bits of flour are visible, adding remaining buttermilk as needed (dough will be sticky and shaggy but should clear sides of bowl). 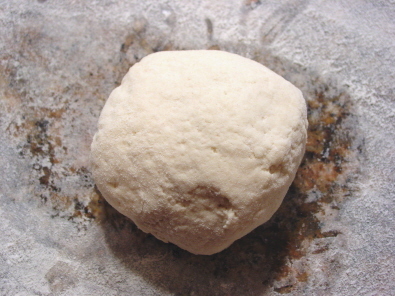 With rubber spatula, transfer dough onto center of prepared work surface, dust surface lightly with flour, and, with floured hands, bring dough together into cohesive ball. 4. Pat dough into approximate 10-inch square; roll into 18 by 14-inch rectangle about 1/4 inch thick, dusting dough and rolling pin with flour as needed. Following illustrations below, using bench scraper or thin metal spatula, fold dough into thirds, brushing any excess flour from surface; lift short end of dough and fold in thirds again to form approximate 6 by 4-inch rectangle. Rotate dough 90 degrees, dusting work surface underneath with flour; roll and fold dough again, dusting with flour as needed. 5. Roll dough into 10-inch square about 1/2 inch thick; flip dough and cut nine 3-inch rounds with floured biscuit cutter, dipping cutter back into flour after each cut. Carefully invert and transfer rounds to ungreased baking sheet, spaced 1 inch apart. Gather dough scraps into ball; roll and fold once or twice until scraps form smooth dough. Roll dough into 1/2-inch-thick round; cut three more 3-inch rounds and transfer to baking sheet. Discard excess dough. 6. Brush biscuit tops with melted butter. Bake, without opening oven door, until tops are golden brown and crisp, 15 to 17 minutes. Let cool on baking sheet 5 to 10 minutes before serving. I tried your biscuit last night and it turned out great! I have been looking for such a flaky and light biscuit. All of the biscuits were gone before I took a picture of it. I am very pleased with your biscuit. My son ate 5 of them! He really liked yours. P.S Thank you, Debra Wink too! Your posts of " Baking powder" and this one are very useful. I couldn't find "ARGO" and I used " RUMFORD" that was just opened. All of your biscuits look awesome. And thank you! These biscuits are very good, I totally agree. If you can't find ARGO at your market, you might look for the Bob's Red Mill next time, in either the health food area, or with the other BRM products. Either will give so much more lift in this recipe than Rumford. Not to disparage Rumford though---it is my favorite for cakes. P.S. Just to clarify and give proper credit, this recipe, as well as the flouring tip came from Cook's Illustrated, and is the same one used in the baking powder testing. Thank you for your kindness, Debra! Thank you for your P.S too, that is very generous. Have you ever tried to use homemade butter milk for the biscuit? I make homemade unsalted butter to make croissants and it turns out great and tasty , and I used the butter milk that I squeezed after mixing some whipping heavy cream.. Some people use heavy cream. I don't know which is good though. Surely,the buttermilk tastes better than the store ones that I used to buy. even with your mistakes, debra, they look gorgeous nevertheless. isn't cook's illustrated just great? well their slogan is "recipes that work" or something to that effect. thanks for the tip about spraying non-stick oil on the surface. i use a silicon mat, but will try your technique as well. for xaipete, thanks for that recipe! David, I have a small strainer I sometimes use as a flour shaker, although I've gotten pretty good at the sideways toss :-) Regardless of how evenly the flour distributes, I found the oil and flour to work better than flour alone, where the flour needs to be pretty thick, as for sticky biscuit dough. And it is quicker, because you can dump the flour and spread it with your hand. 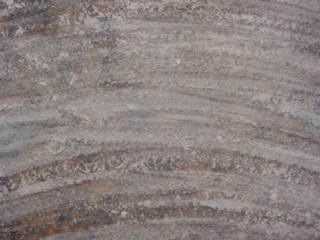 It makes a velvety surface. Ian, the tops and bottoms were crisp, and pretty darned tasty. The height is impressive, because there's so much baking powder. I'm still trying different brands, to see which tastes the best without compromising rise. For single-acting baking powder, combine 2 tablespoons of cream of tartar with 1 1/2 tablespoons of cornstarch and 1 tablespoon of baking soda. The mix will keep in a tightly sealed jar for up to 1 month. I haven't tried it, but she was the queen of Southern cooking. I haven't tried it, but she was the queen of Southern cooking! I have their recipe for fluffy biscuits memorized. Back when I was a bike racer and burned a lot more calories I had them nearly every morning. I never did try the flaky version. Thanks for the reminder! Thanks for all the great tips and tricks. I recently tried some biscuits and was hoping you might be able to help with some claification. 1. I followed the Bakewell cream biscuit recipe but substituted the 4 tsp Bakewell cream & 2 tsp baking soda for 4 tsp glabber girl baking powder as the recipe stated for a conversion. If I read correctly I should have increased the amount of baking powder to 6 tsp not 4? 2. I also substituted buttermilk instead of regular milk. Should I have added something to offset the acid in the buttermilk? 3. While incorporating the butter is there a risk of over working the fluor and making the dough tough? Or is it to early in the process to worry about that? 4. When I added the buttermilk and mixed the dough I couldn't get all of the fluor to incorporate into the dough ball. I was afraid to overwork the dough though. Is it normal for the dough to be very crumbly or should it all come together in a ball? Should more liquid be added? 5. In regards to flaky biscuits once you've done your initial roll out of the dough do you dust the dough prior to folding to keep the layers from fusing together? Also after folding and then rolling the dough it seems like it would just work back together. Do the layers naturally stay apart? Biscuits can be challenging, can't they? But very satisfying to master. Like most other things baked, a little practice goes a long way. That's right, 4 tsp Bakewell cream + 2 tsp baking soda = 6 tsp (2 Tbl) baking powder, according to the guidelines on the label. But the general rule is that there is 1/4 tsp of soda per 1 tsp of baking powder, so their substitution rate may be a bit off (4+2 tsp being the equivalent of about 8 tsp. baking powder, since powder has some filler to bulk it out and keep the acid and base dry). For comparison, 8 tsp for 4 cups flour is the same amount of leavening as the Cook's Illustrated recipe earlier in this thread (1 Tbl powder + 1/2 tsp soda is the equivalent of 5 tsp baking powder for the 2 1/2 cups flour)---or 1 tsp for every half-cup. Not necessarily, although you probably didn't have enough leavening to start with. Assuming 8 tsp of baking powder, there should have already been enough leavening, so if you were happy with the taste, you wouldn't need to adjust anything else. If you found it too tangy, then you can reduce the baking powder a bit and add a little baking soda---up to 1/2 tsp per cup of buttermilk, to mellow it and provide the balance of the leavening. The Bakewell Cream recipe calls for 1 1/2 cups milk, so to substitute buttermilk, you can add 3/4 tsp baking soda and reduce your Clabber Girl to 4-5 tsp. I don't think so, because butter is mostly fat which coats the proteins and interferes with gluten formation---that's why it is added before the liquids. 4. When I added the buttermilk and mixed the dough I couldn't get all of the flour to incorporate into the dough ball. I was afraid to overwork the dough though. Is it normal for the dough to be very crumbly or should it all come together in a ball? Should more liquid be added? Biscuit dough should be relatively wet, so it sounds like you needed more liquid. Keep in mind that buttermilk is thicker than sweet milk, but also that different flours absorb at different rates. The recipe states that "some flours may require a little more liquid to make a nice soft dough." That gives you an idea of the consistency you're looking for. The Bakewell Cream is a fluffy biscuit. For flaky, as the Cook's recipe here, instead of cutting all your fat into the flour in the usual way, you rub the butter into big flakes, being very careful after to mix your liquids in gently (I toss with a rubber spatula), so as not to destroy all those flakes. When you roll it, the flakes flatten out and allign with the dough, and the subsequent "turns" serve to laminate it with all those flakes of butter separating the dough layers. You want to avoid working in any more flour because that will toughen and make for dry biscuits. The layers will stay apart, so long as you take care to use proper technique and temperatures throughout. I use buttermilk or another acid in a q12uick batter o\ir dough, I would rather use a much smaller amount of Baking Soda, which is activated by acid, rather than 6 T of Baking Powder, which I feel leaves a metabolic taste that is just horrid - especially 6 T worth!!! Well I broke down and ordered the Bakewell cream the other day. Last night it arrived and proceded to make a 1/4 batch of their biscuit recipe. They were delicious but I still walked away with a couple concerns. 1. Per the recipe I divided all measurement in 1/4. This in turn had me adding 6 tablespoons of buttermilk to the 1 cup of fluor(+ other items) It wasn't nearly enough. After I attempted to stir with a fork for a bit I gave up, went to my wing it routes, and added a little more buttermilk until all the ingredients were together. This did make a slightly sticky dough though. 2. 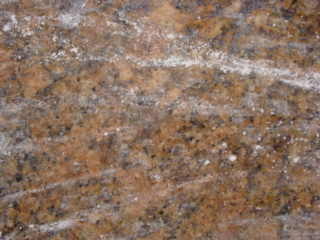 I typically bake on a stone and have noticed that if i put any biscuit on the stone but the time the inside is done the bottom and lower sides are pretty crunchy. Any ideas? Should I just use a cookie sheet and my silpat? 3. 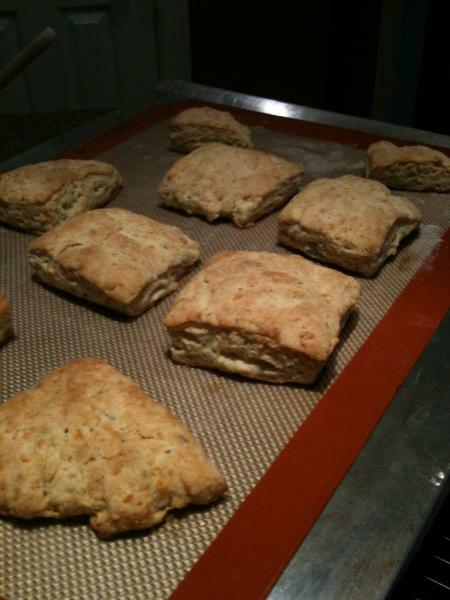 The biscuits had great flavor(best yet) but they crumbled to bits on the inside. As soon as you broke them apart with a fork and attempted to place jelly on them the inside would just stick to the jelly leaving a shell. Any advice on this little mystery? Adam, you inspired me to jump in and bake a batch of biscuits. Two, actually. Since you're learning, I didn't want to give you an untested, and possibly problematic recipe. Plus, I received a special gift of honey this past Christmas from a dear friend, and what better way to enjoy it than biscuits with honey and butter? Yum! So, here is the quarter-recipe I came up with, based on what you are wanting to do with the Bakewell Cream recipe---substitute buttermilk for the regular milk called for. Because your dough is consistently too dry, I decided to try 1/2 cup buttermilk instead of 6 tablespoons. It made the measuring and calculating easier. 1/2 cup buttermilk will neutralize 1/4 tsp of the soda (half of it), leaving another 1/4 tsp of soda to react with the Bakewell Cream, so that is reduced to 1/2 tsp. Make sense? 1 part soda : 2 parts Bakewell Cream. The dough was very wet---about the same as I remember the CI recipe being. I gave it six kneading strokes before rolling to 1/2" thick. I cut 4 rounds and then stacked the scraps, and rerolled for a 5th. I baked them at 475, per the recipe, but my baker instinct told me that was too hot (they set too soon and didn't rise as high as they should have). And I wasn't satified with the taste, the texture or the color, either. But one thing was illuminating---the 5th biscuit, from the rerolled scraps looked the best, inside and out. So I mixed up a second batch using bleached all-purpose (the first batch was unbleached AP, both Gold Medal flours), in addition to the 6 keading strokes, I also gave the dough 2 turns before rolling out and cutting (one envelope fold in each direction as if laminating). And lastly, I reduced the oven temperature to 425F and used the convection feature (because that's what my oven's manual recommends). Note how much taller they are than the first batch (the tray of four). They look like little Frankenstein heads. These buscuits were better in every respect than the previous batch (although they are not as good, in my opinion, as the CI flaky biscuits). As to your questions, I think that the brief kneading and folding will do wonders for the crumbly problem. And I think it's best to bake biscuits on metal---I prefer aluminum, myself, but experiment with what you have. Yummy looking honey (and biscuits of course!). Is the name of the beekeeper a coincidence or...........? I threw that one in just to see who was paying attention---boy, there's nothin' wrong with your eyes! Ya know, according to Oprah, there are no coincidences? Over the weekend I cooked a pot of red beans and rice for the family and thought about making some savory biscuits. I again went with the bakewell cream 1/4 recipe and below are the results. 8 tbl buttemilk. I should be using 6 tbl but it's not enough liquid. Even with 8 tbl of buttermilk i find myself mixing the dough and then having to get my hands into the mix to grab all the bits and pieces that are crumbling away to stick into a ball. After i do this the dough seems to stay together but simply mixing won't get everything to come together. Once i have mixed everything and finally got all the crumbles and dry bits to come into a ball I lay out the ball onto a work surface and knead it a 4-6 times buy pushing the dough down, pulling the far side on top then turning the dough and repeating. Again i do this 4-6 times and then roll the dough out and cut into squares. The oven is set at 425(verified with a thermometer) I let the biscuits cook for 6 minutes then let them set for 6 minutes. I have don't open the door but it makes no difference. P.S. I added some italian seasoning, minced garlic, and shredded cheese to the mix on the ones in the mixture and the taste was great. Although dense and not very fluffy. Ahhh, okay, now we're getting to the bottom of it. Well, the King Arthur all-purpose explains a lot, because it is more bread- than pastry flour. That's not to say you can't make good biscuits with it, but a little extra care and understanding are in order. By your description, it sounds like the dough was still too dry. The biscuits in your photo, likewise, look too dry and that will hinder the rise. Strong flours absorb more liquid, and that is part of it. So, the way you measure flour is going to make a big difference here, and I'm willing to bet that you are using too much. Do you have a scale? If so, weigh 4 1/4 oz KA-AP flour per cup for this recipe. If you don't own a scale, the way to measure the right amound is to first fluff the flour with a fork. Then use a large spoon, like a soup- or serving spoon, to transer the fluffed flour to your measuring cup. Set the cup on a plate or in a bowl to catch the overflow, and sprinkle the flour lightly into it, taking care not to shake of jostle the cup. You don't want it to pack or settle at all. Let the flour mound up over the rim on all sides, and then sweep the excess away by running the back of a long knife or other straight edge across to level the top. That will give you the right amount of this flour for this recipe. Dip-and-sweep method would be fine for a softer flour. Because King Arthur is stronger than other AP flours, you don't want to work it as much. I tried a mini batch this morning, and 6 kneads were enough. It started to show the first signs of gluten development during rolling, so I did not fold and re-roll as I did with the Gold Medal flours. 1/2 tsp each soda and Bakewell cream were plenty of leavening, and that brings up another issue. You wrote baking powder above. Is that what you used, or did you mean baking soda? It's very important to use soda, or the bakewell cream won't have anything to react with. If your oven is not convection, try 450F, keeping in mind that you may have to adjust that once you get the dough right. And if you haven't already, take the stone out of the oven when baking these. That makes a lot of sense Debra. I had been simply scooping up 1 cup of fluor and then sweeping the top flat with a knife. Apologies on the baking powder misprint. I did indeed use baking soda. My oven does indeed have a convection setting but i haven't used it yet on biscuits. I have also baked these biscuits at 475 with similiar results to the pictures. No real rise. If I understand what your saying. You use 1 cup(measured by weight) of fluor, 1/2 tsp bakewell cream and soda. and then the rest of the ingredients are what I said in the previous post? Was my using 1 tsp each of bakewell and soda to much in your opinion? Also when you spoke of gluten development are you speaking of the tendency of the dough to begin to bounc back from rolling. I have tried to keep my kneading and rolling to a minimum. I knead only enough to get the dough mixed(might be fixed with the proper fluor amount). Also I only roll enough to get the shape I'm after and no more. Was my using 1 tsp each of bakewell and soda to much in your opinion? Yes. 1/2 tsp each is plenty, as you can see from my Frankenstein biscuits, and raising each to 1 tsp leaves an excess of soda, throwing off the balance. Also when you spoke of gluten development are you speaking of the tendency of the dough to begin to bounc back from rolling. 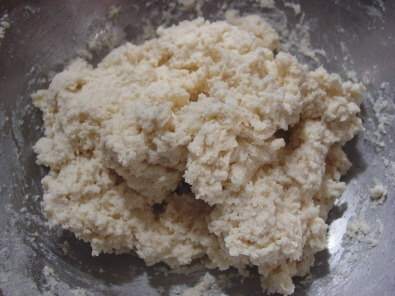 After Mixing the dry ingredients the dough looked like this. Then I added the buttermilk and using a fork I gave my arm a workout until the dough looked like this. I then turned the dough out onto a floured work surface. The dough was still kind of crumbly at this point so I gave it 4 good push, fold, & turns and then rolled the dough to the shape you see here. Also the dough at this point began to get elastic. I then cut my squares( a little smaller then usual) and buttered the top. Also I preheated teh oven(using the convection feature this time) to 425. I placed the biscuits into the oven and the rise was more then in the past for sure. Nothing like the original poster but more then i had experienced. The below picture was after 5 minutes. after another 5-6 minutes in the oven i pulled them. 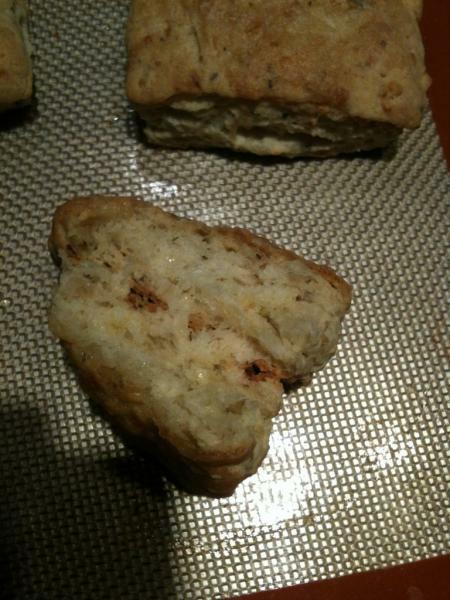 The result was a very good biscuit, pretty fluffy and light and in comparison to the weekends attempt much better. Below is a side by side comparison and the interior crumb of the new biscuit. I will truck on though. I MUST MAKE THE PERFECT BISCUIT!!!!! The jelly is counting on me. Adam, those look much better :-) Leaveneners need moisture to react well, and the dough needs to be soft enough to puff easily. It looks like you're on the right track with the dough, so reduce the soda and bakewell to 1/2 tsp each. The next step is to optimize the baking process, because that is just as critical to high-rising biscuits. If you still have it, get out the user's guide for your oven and look up what it recommends for buscuits. Use that setting. If you don't have one, try 425F with convection for the whole baking process (don't turn the oven off halfway through). But, keep in mind that all ovens perform differently. Who would have thought that such a simple a concept as "Biscuits" would prove as troublesome as it has turned out to be. I can make a ciabatta or fiacotta like nothing..Biscuits....not so much...hahahahahah The irony. What do you all typically use to mix your biscuit dough. I have been using a fork and thats no fun. Does anyone use a stand mixer to quickly get it all together? or just a good ole fashion wooden spoon. I mix all the ingredients in a bowl with a wooden spoon until there isn't any dry ingrients left. once I place it on a floured work surface I knead it 6-7 times by pressing the dough down with the ball of my hand then folding it back towards the middle. I turn it 90 degree's and repeat 6-7 times. Then I flip the dough over and roll it to 1/2 thick. I cut the dough with a metal scraper into squares. I place the biscuits onto a metal cookie sheet and put them into a 425 degree oven for 10-15 minutes. Any pointers that I might be doing wrong? I want the frankenstein biscuits!!! how does everyone save their biscuits that they don't cook? I tried to save some by forming into biscuit shapes then Semi freezing them individually. Finally I put them in a ziplock. Problem is that when I cook them they don't rise much at all. If I cook them fresh they rise well. I'm cooking the frozen ones in 450 degree preheated oven. Placed frozen on a pizza stone.